Today GORTHAUR’S WRATH is a leading black metal/extreme metal band from Croatia/Germany. They were formed back in 1998 by Morbid, who is the only remaining founder of the original line up. 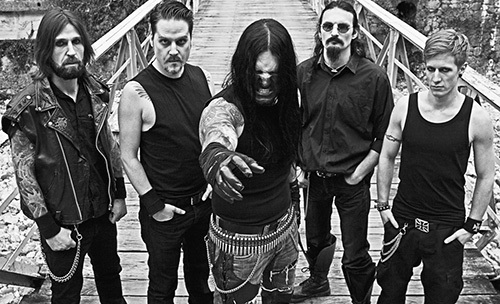 The band started as primitive black metal, reflecting the times and origins of its beginnings. GORTHAUR’S WRATH performed throughout their first era of existence mostly on their home territory of Croatia, Slovenia, Italy and Bosnia. The debut album “Ritual IV” was recorded in 2009 and was released on March 28th 2011 through Casket Music Records from U.K. During their first European-Tour with EKTOMORF/KORZUS Morbid joined forces with his long time spiritual brother Māra (bass guitar/synth). In early 2011 German guitarist Ross Feratu (MY BLACK OMEN, THE SPOOK, EL BRUJO’S GORE-CHESTRA, RAMONSTARS) joined the band and is now lead guitarist and was main songwriter for the upcoming new album “War For Heaven”, which was recorded at Woodshed studios by Victor Santura (Dark Fortress, Triptykon) in May-June 2012. Before the album recordings GORTHAUR’S WRATH were happy to announce their second guitarist Ralf Conrad (LAST ONE DYING), who also comes from Germany.